An initiative of events + opportunities designed to foster Long Island's emerging creative talent. Throughout history the greatest artists have been successful by being avant-garde, ahead of their time in style while also being able to keep up with the ever changing world we live in. One artist straight out of Long Island started his legacy by being the first to create those trends that would be followed by others in the graffiti world. He chose the name Phetus to embody this idea of being the origin to what would soon become cutting edge. 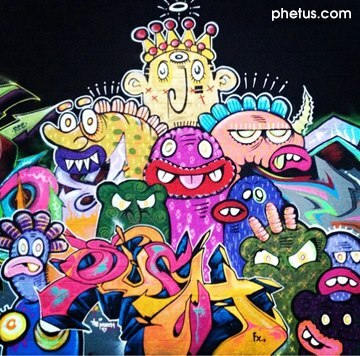 Phetus began his venture by tagging the LIRR areas with his now infamous “Phat Phace” logo to make his mark as an artist while others turned to a microphone during a time when the Hip-Hop culture was rising. Creating a logo to signify his name was innovative at the time when other artists were simply tagging their name in typical bubble lettering. Taking his originality beyond the walls of Long Island, Phetus opened “Concrete Vibes”, a clothing boutique and gallery to show case his art being the first gallery on Long Island dedicated to graffiti. It was this exposure that would lead Phetus’ designs to demand the attention of well known Hip-Hop artists as well as internationally known graffiti artists which took his popularity worldwide. Taking graffiti to places not seen before Phetus’ creations are displayed on a series of vinyl toys called “Fat Caps”, on traditional canvases next to some of the hottest cars at the New York Auto show, custom made clothing, and art shows across the nation. The digital world we have all become so fixated with is no exception with a successful graffiti app “Graffiti Spraycan” going strong in its first year. His constant evolution has brought this art medium to another level. From the LIRR to expanding his art to the walls around the world, Phetus is truly a pioneer with a spray can and he will be in Huntington Village August 24th for SPARKBOOM’s “Off the Walls” event starting at 2:00 pm at the Huntington Arts Council. Phetus will be creating his art in action at this event, to see a true artist at work is something that can’t be missed. Follow us for updates about what we are doing to help you as artists!